Bees are among the most important species responsible for pollinating about one-third of the world’s food supply, with their contribution in the United States alone valued at $15-20 billion each year. Rapid declines in honey bee colonies globally, and in the United States specifically, have put increased strain on agricultural pollination and the future of food security. Parasites form one of the factors affecting bee population declines, with Nosema ceranea and Nosema apis being some of the most common. Nosema apis infection can have the symptoms of dysentery and defecation of honey bees at the entrance of the hive, but Nosema ceranae infection does not show any physical symptoms. 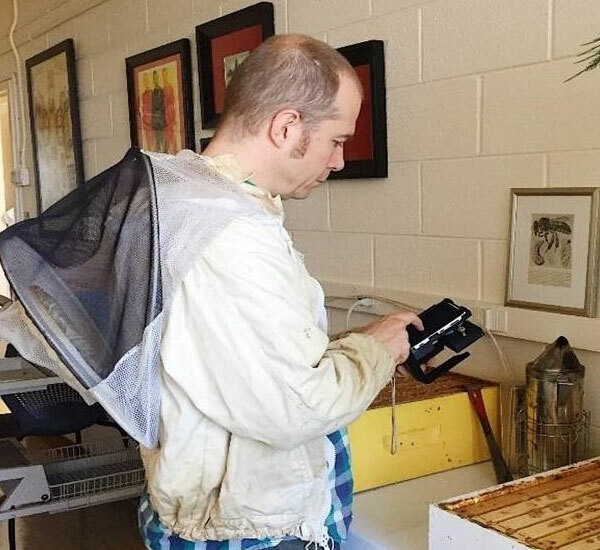 This ‘silent killer’ of honey bees infects worker bees, drones and queen bees, and may even result in colony collapse. Aydogan Ozcan, UCLA Chancellor’s Professor of Electrical and Computer Engineering and the associate director of the California NanoSystems Institute at UCLA led the research in collaboration with Jonathan Snow, an assistant professor at the Department of Biology at Barnard College (NY), and Hatice Ceylan Koydemir, a senior research associate at UCLA. The study was published in Lab on a chip, a journal of the Royal Society of Chemistry (UK). “Ensuring the wellbeing of bees is a very important problem for global food security and ecosystem stability. There are many factors affecting rapidly declining bee populations, with parasitic infections playing a significant role. The developed mobile device paves the way to address this emerging problem in an inexpensive manner, and, to our knowledge, it is the first and only existing portable platform for Nosema spore detection in field settings.” said Ozcan.